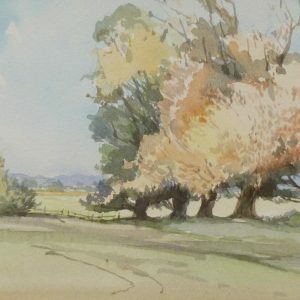 Born in Leicestershire in 1922, the son of a smallholder and a mother herself a keen amateur artist who was a strong influence in the observance and discovery of nature. 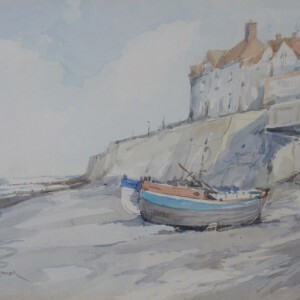 Jason was educated at Market Bosworth Grammar School and obtained a position at Leicester College of Art at an early age where he came under the guidance and tuition of Dan Watson, a RWS member and fine artist. 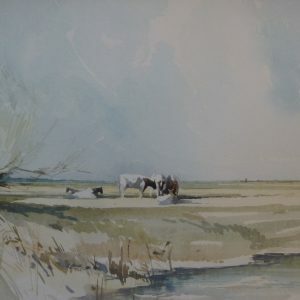 Here, with his love of true watercolour and the traditional masters to study, it was a period of development of sound composition and a mastering of the difficult medium spending long hours in front of nature observing changing moods and light. 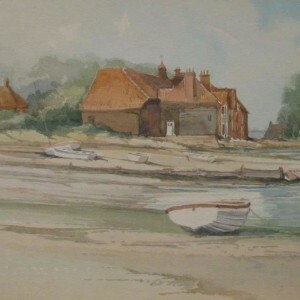 After war service in the Royal Navy and Marines, he spent a brief period in commercial art before becoming a full-time landscape artist. 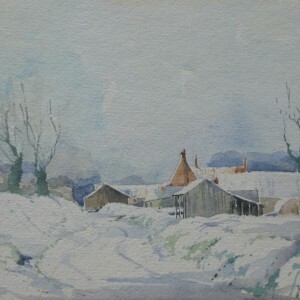 He developed a personal style, notably the use of soft grey-greens and true portrayal of English light. 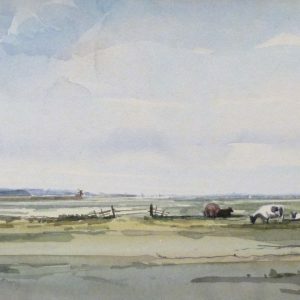 Jason’s attraction to Norfolk began during a Broads sailing holiday in 1947 when he sold his first painting for five pounds in a local pub. 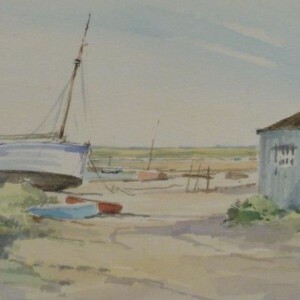 His favourite painting spot was Blakeney and Morston, but his scenes also feature the Broads, mills, boats and animals. 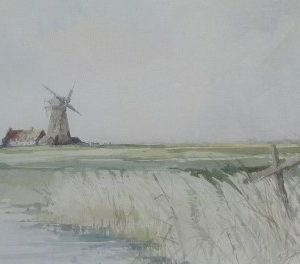 Jason was an active member of the Aylsham Rotary Club and helped in organizing the highly successful Art Exhibitions held in the Town Hall during the 1970s as well as founding, in the early 1970s, the now established ‘Royal Norfolk Show’ annual Art Exhibition. 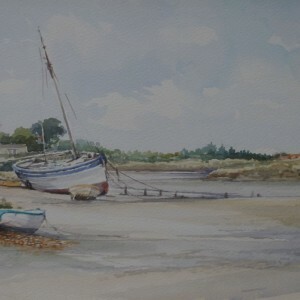 Jason loved demonstrating his watercolours in front of an adoring audience and was affectionately thought of by the ladies of the WI along with many other clubs and societies. 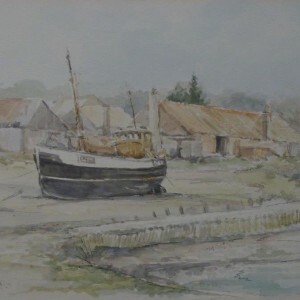 In 1989 a painting of fishing boats was selected for a cover of a telephone book and Jason, with the help of his wife Jo, marketed his work as prints, greeting cards and coasters. 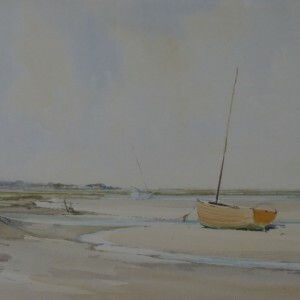 Jason’s annual April Exhibitions at the Assembly House, Norwich were always eagerly awaited with queues forming to attend the preview in order to acquire one or more of his latest watercolours. 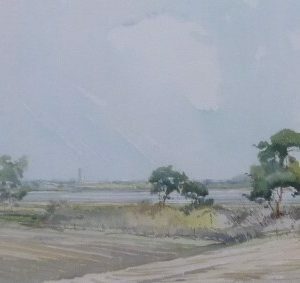 Exhibitions in the UK, Canada and the USA firmly established Jason as a master to his craft and his paintings adorn homes from the grandest to the smallest. 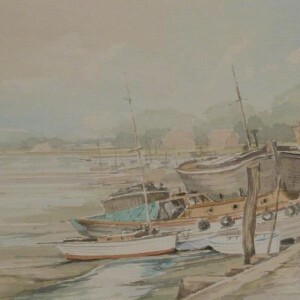 Works hang in many private collections including the halls of royalty and the walls of statesmen and company boardrooms. 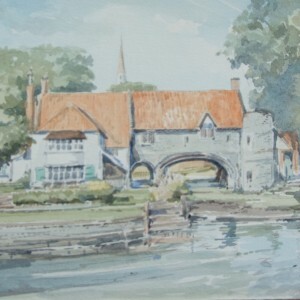 Collectors include the late Queen Mother and the former Prime Minister John Major. 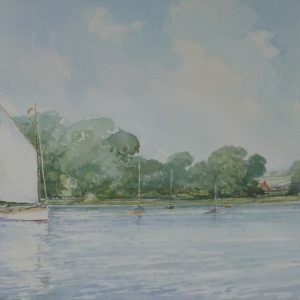 Jason Partner was completing a montage to celebrate the anniversary of Trafalgar when he died in April 2005 at home in Aylsham, Norfolk aged 82.